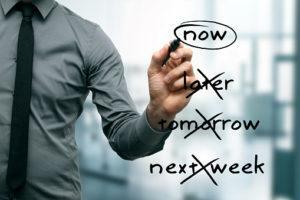 Getting your financial house in order requires putting an end to procrastination and deciding instead to be proactive. All too often people forget that the event of evaluating your elder law and estate planning documents should be an annual one. Far too many people procrastinate until there are no other options but for the court to intervene because the person becomes suddenly incapacitated or passes away unexpectedly. Most people think of estate planning as addressing what happens to your property after you pass away, but if you miss out on elder law incapacity planning issues, this can make it difficult to accomplish your estate planning in the future since you might no longer be of sound mind and ability to do it. The proper time to engage in elder law estate planning processes is now, while you are still clear about what you want and can make a strong case that you are mentally competent at the time you made that decision. Waiting too long could make it more difficult for you to complete these documents and can also raise concerns from other estate planning stakeholders, who might allege that you are not of sound mind or in a place to create such a document. Establishing a relationship with an elder law lawyer is the best way to verify that you have considered all potential issues, including tools like a durable power of attorney and how these tools will work together with your other estate planning documents and strategies like a living trust.